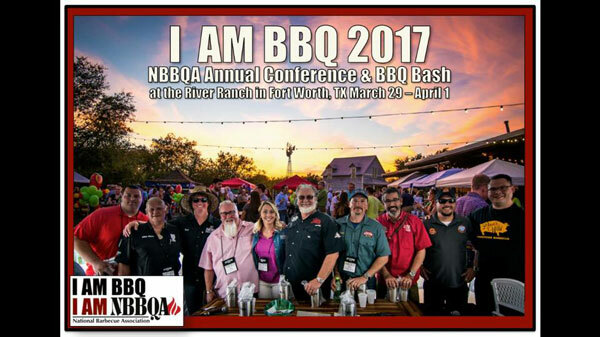 Be sure to mark next year’s calendar from March 30 to April 1 for an awesome 2017 annual NBBQA conference in Fort Worth, Texas. 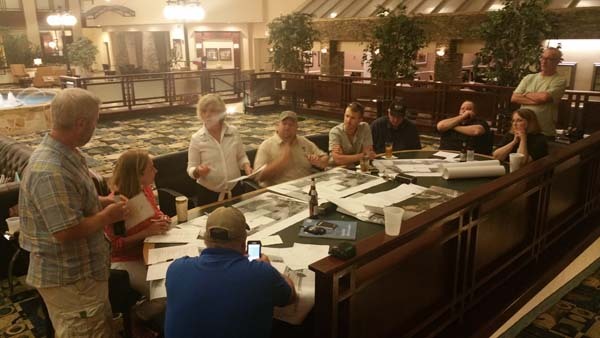 I joined a dozen of the 2017 NBBQA planning committee from Atlanta, Memphis, Mississippi, Texas, and Los Angeles and we descended upon two great event sites where the conference would be held. 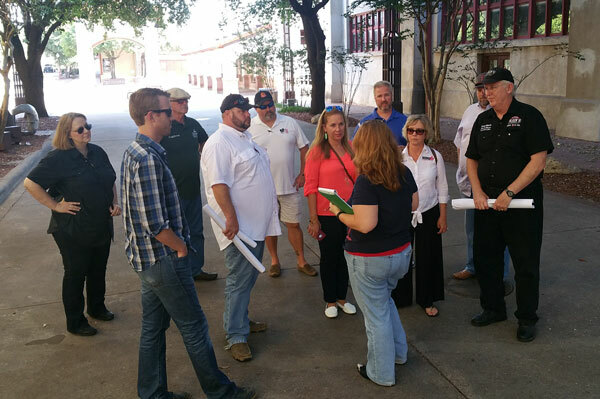 The site visit was needed to map out a spectacular program for the anticipated sellout 2017 NBBQA annual conference bash limited to 500 attendees. 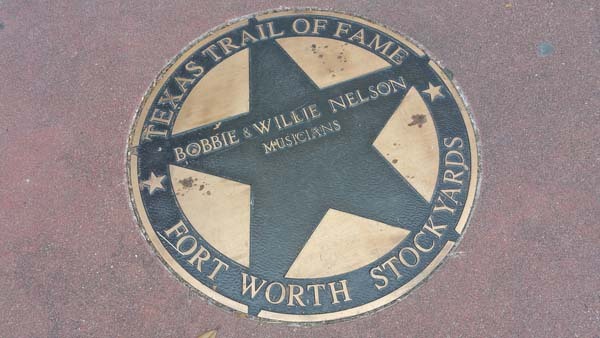 The first one was the River Ranch Stockyards, part of the Fort Worth Stockyards, and it was styled like a rustic retreat for cowboys who were making a “last stop” before moving their herds north along the Chisholm Trail. With seating for up to 900 and three separate event areas and lots of outdoor space to host barbecue and live cooking demos, this facility would be a great fit. 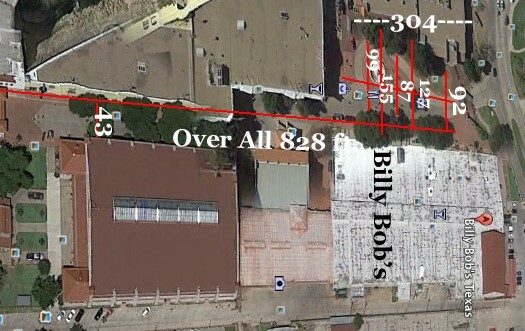 The second site was the world’s largest honky-tonk dance hall called Billy Bob’s Texas located in the Fort Worth Stockyards National Historic District. Its claim as the World’s Largest Honky-Tonk is backed by 127,000 square feet of dancehall, outfitted with over 30 bar stations, a live indoor professional bull riding ring, and a mega 6,000 people capacity. You can channel your urban cowboy with line dancing or two-step lessons and live concerts every weekend from greats like Willie Nelson, Randy Travis, and George Strait. 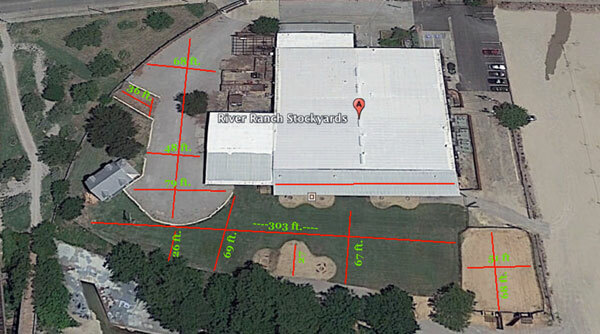 The NBBQA will use Billy Bob’s to host the Saturday Dream Team cookoff on the closed streets next to the saloon. 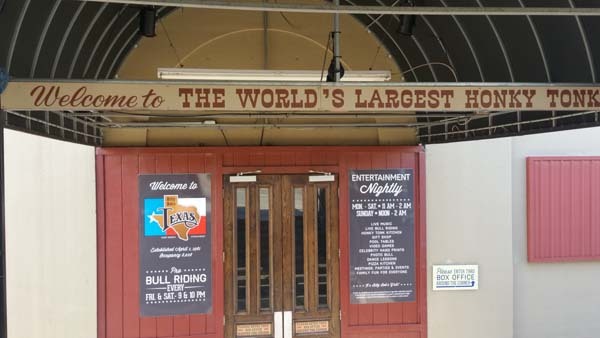 NBBQA members could head on to the club to get a photo on Billy Bob’s signature faux bucking bull, mosey into the gift shop, sharpen their pool skills, or check out one of the many arcade games. Our committee is working feverishly on an informative and fun curriculum so imagine two days of educational seminars on the business of barbecue, live demonstrations, butchery classes, chuck wagon cooking, catering tips, restaurant knowledge transfer, networking with your own Special Interest Groups (SIGs), barbecue restaurant tours, and a climax on Saturday where lucky attendees get to cook on one of 15 dream teams headed by the who-who in barbecue like Myron Mixon, Tuffy Stone, Mike Mills, Melissa Cookston, Moe Cason, and many others. 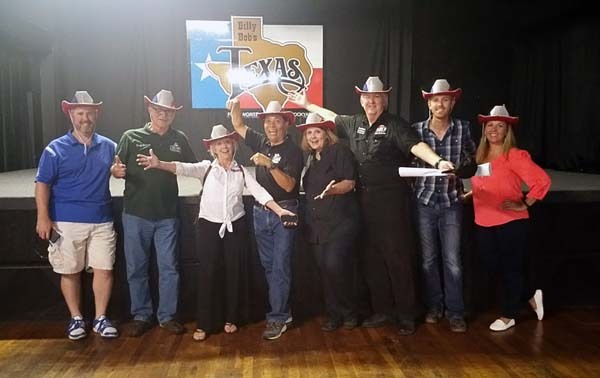 Our advance planning team headed by NBBQA President Linda Orrison (Mama Shed) and CEO Stuart Meyer conducted a whirlwind visit of barbecue restaurants and met with event planners from Billy Bob’s, River Ranch, Fort Worth Wine Festival, and the Fort Worth Visitors Bureau. Together with project manager Candice Crossfield, I’m helping to coordinate the logistics for this 500 person event. Who knows, I may even get to captain the International Dream Team by inviting SYD alumni attendees from Mexico, Hong Kong, Australia, Canada, and Africa to showcase their country’s unique barbecue. 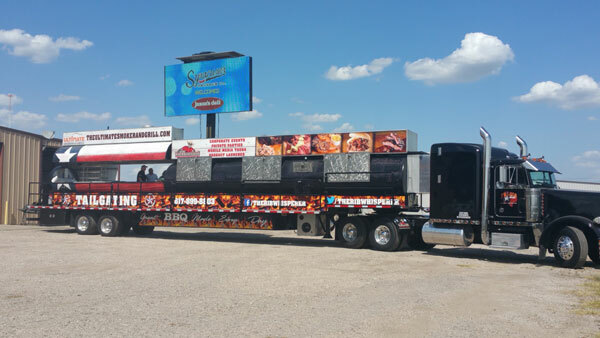 A hundred lucky attendees in two tour buses will be treated to a three-stop five hour BBQ restaurant crawl on Wed, March 29, 2017. 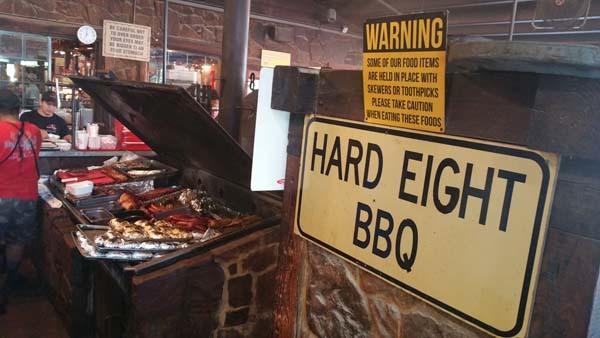 While the short-list of restaurants is being determined, our advance team tried out Hard Eight BBQ in Cooper on Sunday evening. 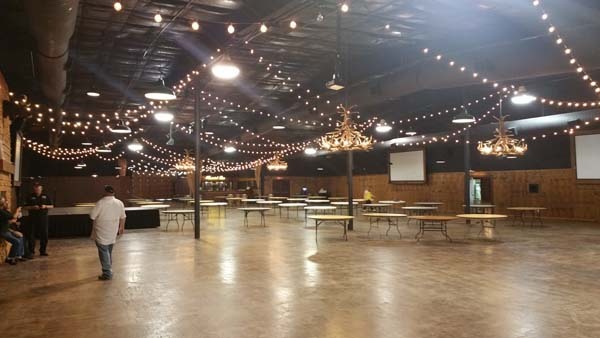 More restaurants will be “auditioned” in the coming months by our Texas-based committee members and details of the Thursday and Friday barbecue education and live cooking at the River Ranch convention center will be mapped out. The Saturday April 1, 2017, Dream Team Bash will coincide with Billy Bob’s 36th year anniversary and a major star will be headlining that night so NBBQA attendees will be in for a treat. Since the Fort Worth Wine Festival will also be happening at the same time, we met with those organizers to generate synergy among our mutual events. We were joined by Kent and Candice Black, owners of the legendary Black’s BBQ from Lockhart, Texas. The Black family are 4th generation pitmasters going back to 1908. Barret Black, their son, also joined the planning committee. Mark Lambert from Sweet Swine O Mine, Chris Jones of Colin Creek BBQ, and John Reeves of Smoking X from Lubbock, and Craig Orrision (Daddy’o Shed) rounded out the team. Just before flying or driving home, our committee had the pleasure to drop by to enjoy some Texas que by Brian McLarty of BigFishBBQ.com. 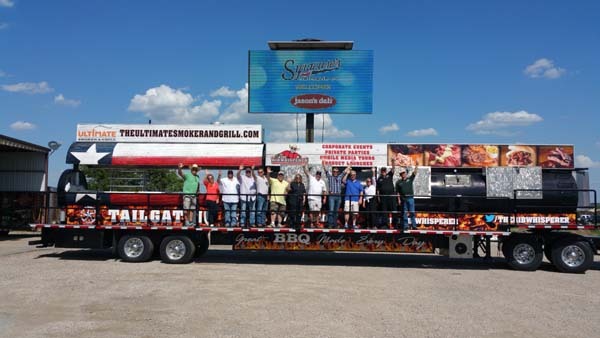 We also took our requisite everything-is-BIG-in-Texas photos by Trace Arnold‘s big rig, The Ultimate Smoker & Grill, which when built was recognized as the world’s largest smoker. That TV you see on a hydraulic jack is 13 feet wide. It’s a really cool design and truly one-of-a-kind pit that can feed several thousand hungry guests at a time. Where do I go to find out where these big BBQ cook offs are being held. I would love to go to see what these competitors are doing and to taste their foods and how they differ from my cooking recipes and taste to others. You can go to NBBQA.org, kcbs.us and cbbqa.org. We are so excited you’ll be hosting your annual conference in Dallas/Fort Worth. If you are in need of a local partner to help spice up your events with some flavorful decor, local entertainment options, or safe shuttle transportation, please give me a shout!